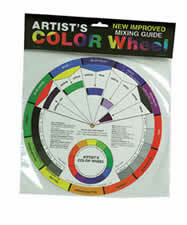 When searching for an art supplies store or specifically the right color for your painting, the Color Wheel is a visual and essential tool. A simple method for illustrating and teaching the relationship of one color to another. Does not replicate exact tones of color. Shows basic color relationships as primary, secondary and intermediates and harmonies such as monochromatic, complimentary, analogous and triadic. This is a cheap art supplies item that will greatly improve the look of your artwork.